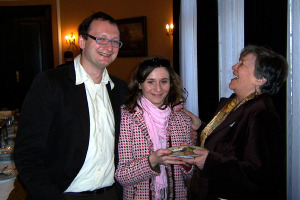 Tomas and Tosia with Renata Zadjman. Tomasz is the right hand of Elzbieta Ficowska and the Children of the Holocaust organization. He and his wife, Tosia, were helpful in many areas on the 2005 and 2008 Life in a Jar trip to Poland. Tomasz is working on his Ph.D. in the teaching of tolerance in Polish public schools, Tosia is a translator. Tomasz and Tosia were a favorites of the students in Poland.